Five mouthwatering cocktails from mixing experts. It's not just the alcohol that brings people together. Cocktails draw on and create family tradition, serve as a holiday centerpiece and make party planning easier. But, of course, holiday cocktails are mostly about their sweet, wonderful deliciousness. So bake those cookies, trim that tree and take out a pretty party bowl or ice-cold pitcher, and get to mixin'. It's time to increase your holiday spirit with one (or more) of these five mouthwatering cocktails from the experts. This spin on a classic sangaree recipe from H. Joseph Ehrmann, the proprietor of old San Francisco saloon Elixir, is a delicious, fruity option, topped with the spice of the yuletide season, nutmeg. Similar to sangria, sangaree was first made when wine would go bad from being shipped, and enterprising drinkers would stabilize the alcohol with citrus and nutmeg. Ehrmann opts for a good merlot -- no need for spoiled wine in contemporary times -- but also says that any good fruit wine will do. "Cherry and bourbon are a natural pairing for me," he says. 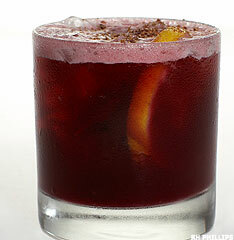 "So I decided to cut the drink with bourbon, which blends superbly with the merlot. The lemon brightens the drink and makes it surprisingly refreshing and light, while the nutmeg provides a wonderful nose on every sip and creates a tie to the holidays." In a mixing glass, muddle the cherries (if no pitter, just remove pits after muddling). Add simple syrup, merlot, bourbon and lemon slice. Top with ice to two-thirds full and shake lightly. Empty contents into a 10.5-oz. Old Fashioned glass. Top with grated nutmeg to garnish. For mixologist Tony Abou-Gamin, featured on "Iron Chef" as Mario Batali's bartender, his favorite holiday cocktail is all about tradition. He goes back to where he honed his craft, to Port Huron, Mich., just outside of Detroit, and to The Brass Rail, where his cousin Helen David presided over this town fixture until her death in 2006. For over 60 years, hot, sweet, eggy Tom & Jerry's have been the custom there, as family members pack into the bar to enjoy the holiday treat. One rule: You must wait until the first snowfall to mix up the season's first batch. "At Helen's bar, you check your troubles at the door," says Abou-Gamin. "Three generations of family come together, as the youth have their first Tom & Jerry with their folks and grandparents. It wouldn't be Christmas at the Brass Rail without it." Serves 12 or "4 friends, 3 each"
Separate egg whites and yolks. In a large mixer, beat yolks until thin, transfer to another bowl. Clean mixer and add the egg whites and cream of tartar, and beat until stiff. Add powdered sugar and fold in yolks. Mix until batter is thick but light. In a pre-heated mug, add 1 heaping ladle of batter. Add rum and brandy. Top with hot water and dust with freshly grated nutmeg. Serve with a paddle or spoon. For an exotic twist on a holiday punch, " It's 5 O'clock Somewhere" author Colleen Mullaney suggests this "pink lady" of cocktails. "Punches are great attention-getters," she says, "and you can use what you already have. I use a clear, crystal bowl that was a wedding gift, mix-and-match glasses, and the punch station becomes a centerpiece, the water cooler at the party." Mullaney also likes champagne cocktails during the holiday season, as they can be reasonably concocted with inexpensive Champagne and fruity infusions like raspberry and limoncello. But, here, lick your lips and take a look at her tasty take on the "Sing Sling." Pour all ingredients into a large shaker and mix well. Pour into ice-filled glasses, then garnish with pineapple slice and cherry. In a mixing bowl, beat together softened butter, brown sugar, vanilla extract and spices until well-combined. Refrigerate in an airtight reusable container for up to a month or place in your freezer until ready to use. To make a Hot Buttered Rum: In a pre-heated coffee mug, combine 2 heaping tablespoons batter with 1 ½ oz. 10 Cane Rum. Top with boiling water and stir well to mix. Serve with a spoon. If you can't decide whether to serve a hot or cold cocktail at your holiday festivities, why not do both? This Ehrmann-invented drink can be served either way, but plan ahead, because the cardamom, cinnamon and cranberry infusion that creates that holiday spice takes a good day to reach full flavor. Ehrmann suggests the pilgrim as a nice holiday meal aperitif, or as a fine cocktail in whatever bar or party setting suits you. Cold cocktail directions: In a mixing glass, add all ingredients, fill with ice and shake well for 10 seconds. Hawthorne strain into a wine glass and garnish with a long lemon twist. Warm cocktail directions: Mix all ingredients in a mug and add 3 oz. hot water. Stir and garnish with a wide lemon disc twist. In a wide-mouthed glass infusion jar, place 1 liter of Wild Turkey 101 and two barspoons of cardamom seeds. Close and leave in a dark, cool place for one day. Strain out cardamom and add 1.5 cups dried unsweetened cranberries and three sticks of cinnamon. Close and leave for another two days, agitating once per day. Strain solids and store in the original Wild Turkey bottle with proper labeling.